Capturing the elegance of European and the British manor houses, stainless steel and copper chimney pots add curb appeal to your home. 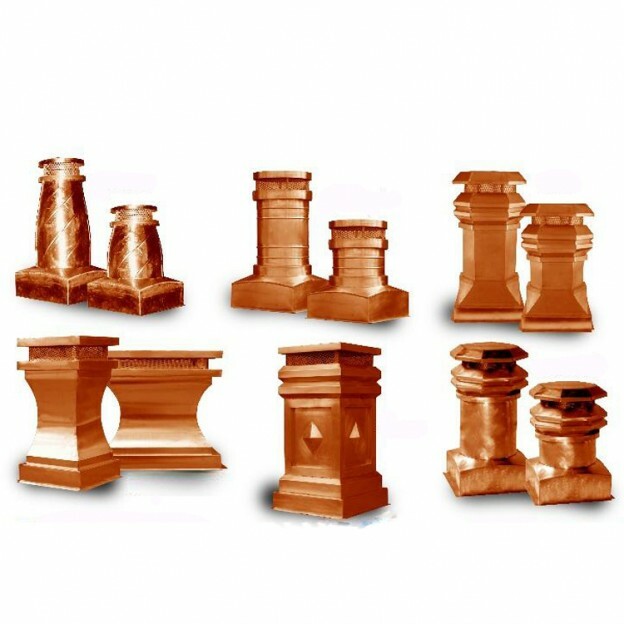 Beautifully crafted, these striking chimney pots improve your home’s architectural interest. They will fit round, square or rectangular flues. 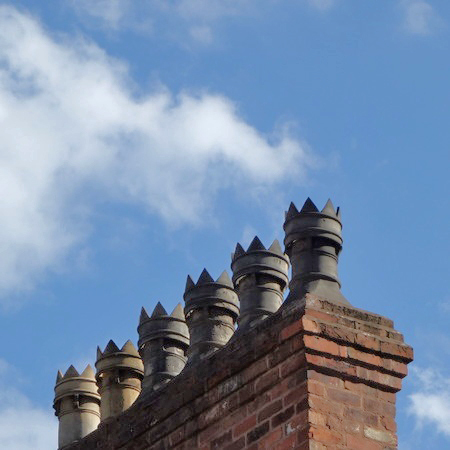 When clay chimney pots came into use in the 14th Century, their main purpose was to improve the draft of the then-prevalent coal fires used for cooking and household heating, thus removing coal fumes from the home. Fumes from coal fires are quite unpleasant, so improving the quality of the air improved the quality of life. Chimney pots were very popular in England around the midpoint of the 19th Century, when builders began to use them decoratively. Some of the most complex and ornate designs appeared in the Victorian Era. As working class neighborhoods developed in the U.S., clay chimney pots found their way here to make coal-fired heating systems more efficient and user friendly. When oil and gas-fired heating systems were developed, however, interest in these pots for chimneys faded away. Many were discarded and many more fell into disrepair. They were rarely used for decades. Almost all chimney pots were made of clay until recently. Now, stainless steel and copper chimney caps are available. • They are much lighter than clay ones. • The copper ones are much easier to install than clay ones. • Metal pots can survive events that would shatter clay ones, such as limbs blown against the pots. • These metal pots need no maintenance. • The metal pots come with lifetime warranties. • The European style ones by Jack Arnold are UL Listed. Now that architects and builders of upscale home have re-discovered chimney pots, demand is surging. While earlier clay pots for chimneys were just a vertical tube, modern ones have roofs to keep the rain out and wire screens to keep our bats, birds, and beasts. Traditional and modern designs are available. Today they are both functional and decorative. 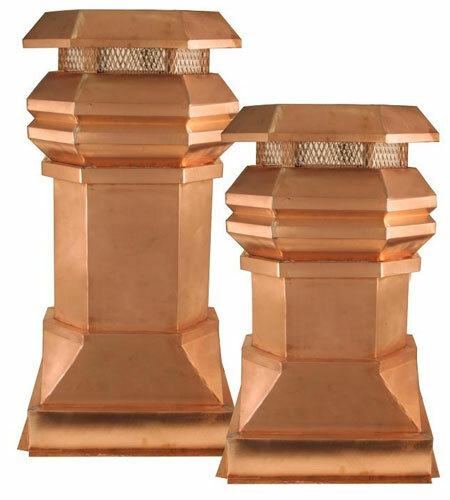 Copper and stainless steel chimney pots are rust-proof. They also function as chimney caps or spark arrestors, keeping sparks in and rain and animals out of your chimney. 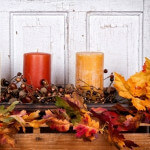 Moreover, they add height to your chimney, improving the chimney’s draft. Chimney pots add curb appeal to your home and make an architectural statement. They are often used in pairs on large, rectangular chimneys, as they were throughout Great Britain and Europe centuries ago.